A hard-hitting road safety presentation called ‘The Decision’ has been touring schools and academies in South Gloucestershire this week. Courtroom drama The Decision focuses on young people between 11 and 14-years-old and their behaviour on and around roads, dealing with pedestrian safety, distraction, carelessness and choices. The play demonstrates how easy it is not to think about your actions, and highlights how dangerous this can be when near roads. It will be watched by around 2000 year 7 students in total during the week (Monday 6 October to Friday 10 October). The play is based on a real life accident and includes flashbacks leading up to the tragic death of a young boy called Jamie. The action cuts between Jamie’s home life, his school and the courtroom, telling the story from all sides and demonstrating the impact on each person involved after the accident. 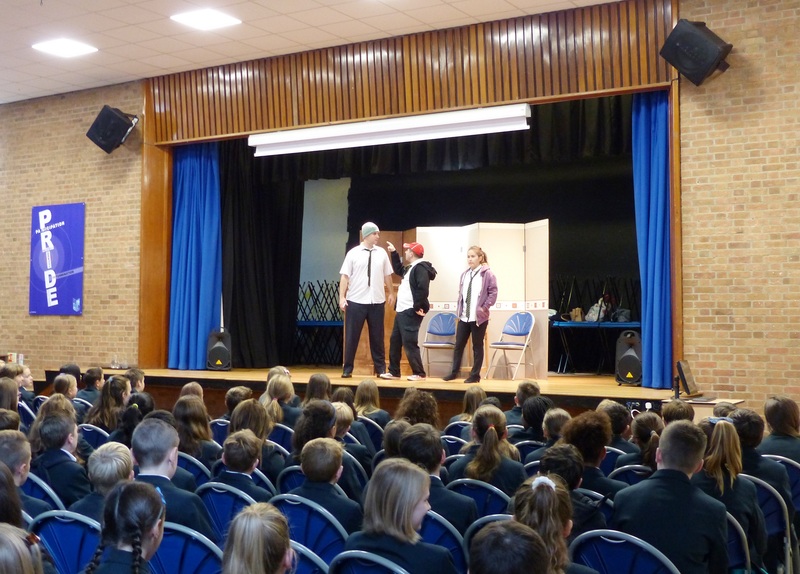 At the end of the play the pupils have to decide who was responsible for causing the accident and were asked to vote, as a jury would, as to whether the driver or pedestrian is guilty. There is a question and answers session at the end, where pupils share some of their own experiences, and a discussion about what may be dangerous when near traffic, for example listening to music, using your phone or being distracted by friends. Some alarming national statistics for Road Traffic Accidents (RTAs) are also given, such as there are five fatal RTAs in the UK every day, and 1 in 30 people in the UK will die as a result of an RTA by the time they are 30-years-old. Road safety officer Pam Williams said: “We have some of the safest roads in the country here in South Gloucestershire, however this doesn’t mean that we can afford to become complacent. “Presentations such as this make a huge impact on their audience and really make them think about the issues covered. Actually seeing people act out the dangerous situations makes it much more powerful than simply dictating to the children. The Decision is visiting 10 schools in South Gloucestershire this week, including Kings Oak Academy (Kingswood), Mangotsfield Secondary School, Patchway Community College, John Cabot Academy (Kingswood), Downend Secondary School, Sir Bernard Lovell School (Oldland Common), Brimsham Green (Yate), Bradley Stoke Community School, Castle School (Thornbury) and Yate International Academy.